Some Starbucks’ customers are outraged over the coffee chain’s new holiday cups, just because they lack a Christmas-themed design. In the past, the company released cups depicting images of snowflakes, reindeer, white doves and ornaments. 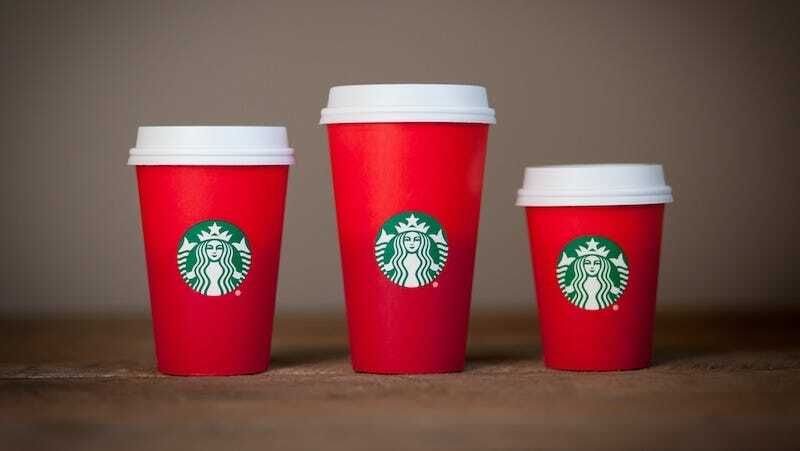 This year, the cups are plain red — and people are really pissed. According to the Huffington Post, some Christian customers feel the coffee chain is oppressing their religion. In a viral Facebook post, one gruff-voiced customer dressed like Fred Durst circa 1999 wrote, “Starbucks REMOVED CHRISTMAS from their cups because they hate Jesus,” then brags about “pranking” Starbucks by having them write “Merry Christmas” as his name on the cup. He also flashes a gun he brought into the coffee shop, disregarding Starbucks CEO Howard Schultz’ request that customers no longer bring firearms into their stores, even in states where open carry is permitted. If Starbucks was actually trying to eliminate all signs of the holidays from their stores, why would they still be producing their popular Christmas blend along with seasonal favorites such as Gingerbread Latte and the beloved Peppermint Mocha?